Aims and Objectives: The purpose of this prospective clinical study was to evaluate and compare the clinical effectiveness of gallium-aluminum-arsenide (GaAlAs) diode laser alone and with topical 2% Stannous fluoride gel in the management of dentinal hypersensitivity. 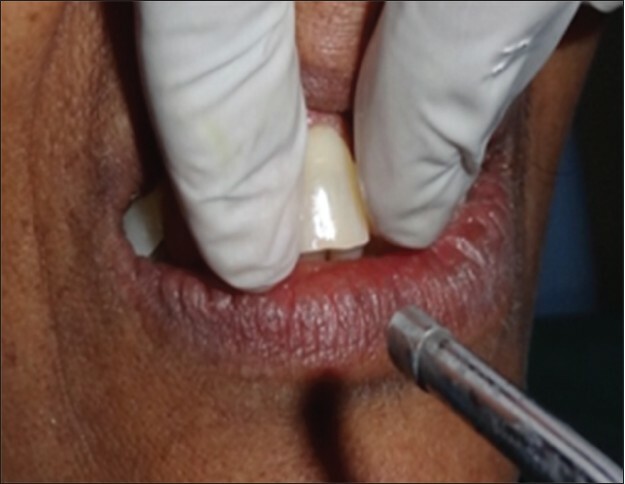 Materials and Methods: Thirty patients (14 males and 16 females, age 19-70 years), contributing 534 teeth with dentin hypersensitivity (DH) were assessed by air stimuli and measured by verbal rating scale (VRS). For each patient, the sensitive sites were randomly divided into Group 1(G1) (267 teeth), treated by application of 2% stannous fluoride gel followed by application of GaAlAs diode laser (Sunny Germany, 980 nm, 2W, 25 Hz) in continuous mode and Group 2 (G2) (267 teeth), was subjected to only diode laser at the same parameters employed in G1. VRS recordings were assessed before treatment, 15 min after the laser application and at the end of 2, 7, 14 and 30 days after treatment. Results: Both the Groups have shown significant reduction in DH after the laser irradiation but reduction in DH was more evident in G1 than G2. Conclusion: Diode laser is a useful device for DH management and addition of stannous fluoride has synergistic effect on laser desensitization effect. The aim of the present prospective clinical study was to evaluate and compare the clinical effectiveness of 980nm diode laser [DL- [Figure 1]] alone and in combination with topical Stannous fluoride (SnF2) gel in the management of DH. The patients recruited for this study were selected from the out-patient division of Department of Periodontics, KLE Society's institute of Dental Sciences, Bangalore, Karnataka. Thirty patients (14 males and 16 females), aged between 19-70 years (mean age: 41.67 years) with the complaint of DH, contributing 534 teeth were enrolled for the study by convenience sampling method. Written informed consent was obtained from patients and it was made clear to the potential patients that participation was voluntary. This randomized controlled trial with split mouth design was carried out from october 2011 to february 2012, with the follow up of 30 days. 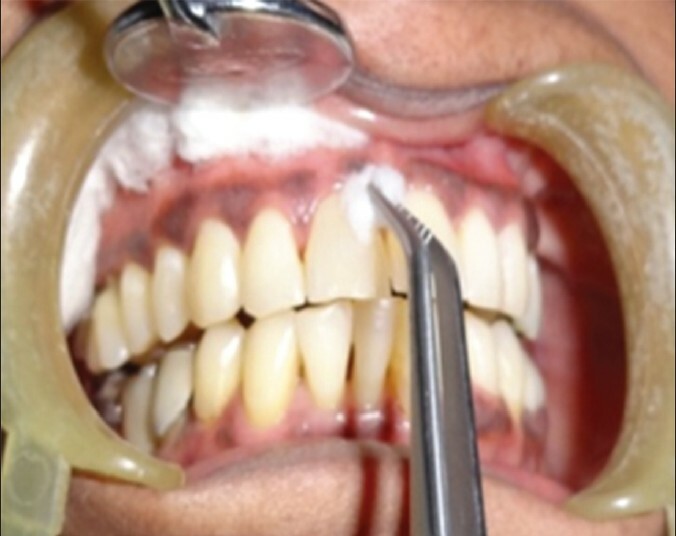 The exclusion criteria for patient enrolment were based on: Carious lesions on the selected or neighboring teeth, any desensitizing therapy on the selected teeth during the last 6 months, cervical fillings on the selected teeth, teeth undergone extensive restoration or endodontic treatment and history of need to continuously take analgesic medication. Phase 1 periodontal therapy in form of scaling and root planing followed by oral hygiene instructions were given to each and every selected patient and the tooth vitality of all sites was assessed. Painful during application of stimulus and immediately afterwards. Air stimulus recordings were assessed before treatment, 15 min after the laser application and at the end of 2, 7, 14 and 30 days after treatment. Group 2 (G2) (267 teeth) - Subjected to diode laser at the same parameters employed in group 1. 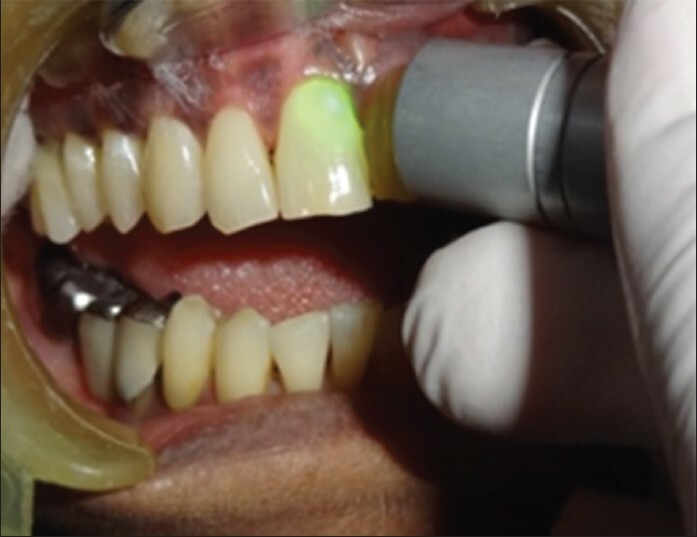 In Group 1(G1), 2% SnF2 gel was applied with cotton pellet and left on tooth surface for 60 seconds before the irradiation. Application of 980 nm diode laser (2W, 25 Hz, continuous mode) at three points on the facial surface and at one point on the lingual surface of incisors and canine and at two points on the facial and lingual surface of premolars and molars were performed respectively. Each site received one application for 30 secs each at baseline. Laser application was kept perpendicular to the long axis of the tooth. In Group 2 (G2), teeth were subjected to diode laser irradiation with the same parameters employed for G1 at baseline. Site prevalence was assessed by Chi square test. Intervisit-intergroup comparison was done by Mann-Whitney test and intervisit-intragroup comparison was done by Kruskal Wallis test. Both G1 and G2 have shown significant reduction in DH after the diode laser application. Statistically there was no difference in both groups w. r. t age and gender. 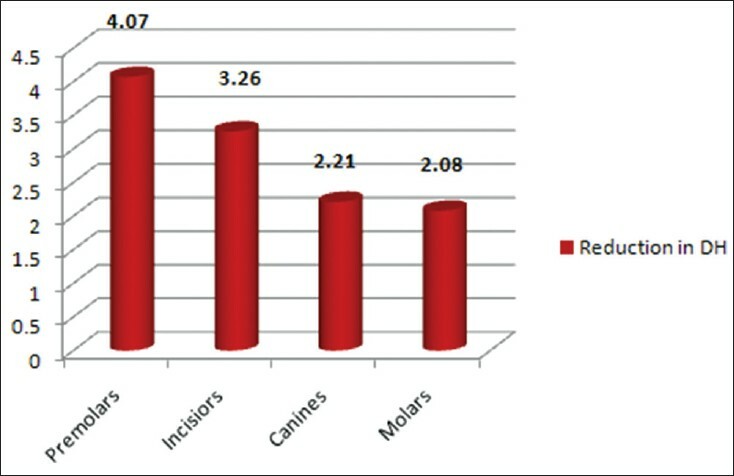 Site specific reduction in sensitivity estimated by chi square test showed increased reduction in premolars followed by incisors, canines and molars [Figure 6]. The mean values of DH in G1 was 0.96 ± 0.84, 0.80 ± 0.84, 0.72 ± 0.82, 0.73 ± 0.82 and 0.63 ± 0.73, as assessed 15 mins post-treatment and on days 2, 7, 14 and 30 after the treatment respectively. In the same way, observed mean values of DH in G2 was 1.54 ± 0.81, 1.28 ± 0.81, 1.28 ± 0.81, 1.26 ± 0.81 and 1.29 ± 0.77 at various time intervals post-treatment respectively [Figure 7]. Thus, a decrease in mean values in DH was observed in both the groups, and the decrease observed was higher in G1. 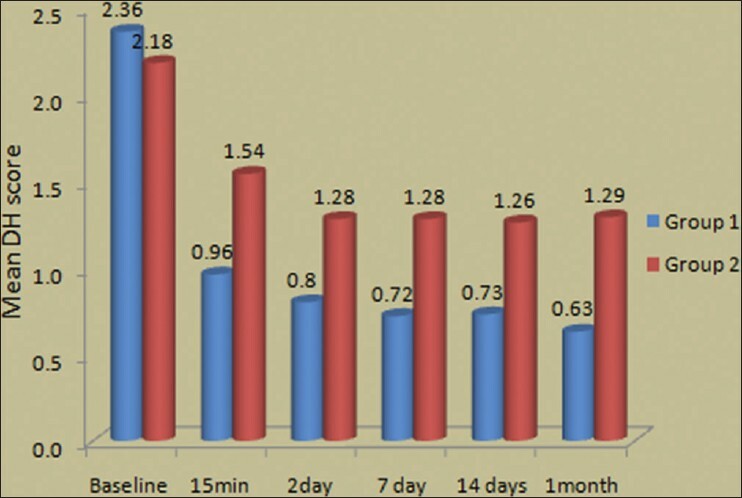 Reduction in DH from baseline to at the end of 30 days was highly significant (P < 0.001) in both G1 and G2 [Table 1]. When intergroup comparison of DH between G1 and G2 was done, the value obtained was highly significant (P < 0.001) at each time interval after intervention [Table 2]. Studies have shown a slightly higher incidence of DH in females than males. This could be due to be overall oral hygiene and healthcare awareness in women that is common between the age group of 20 to 40 years with the peak incidence at the end of third decades. , However in the present study, there was no statistically significant difference in both groups w. r. t age and gender. Interestingly, site-specific prevalence showed increased predilection in premolars followed by incisors, canines and molars. This was in accordance with the study of Flynn et al. who also reported the same DH predilection order. Even though numerous modes of treatments for DH have been discussed in literature, it is clear that, the ideal treatment for DH does not exist. This can be true even in case of combination of different protocols. Traditional methods for the management of DH comprehend the topical use of desensitizing agents, either professionally or at home such as protein precipitants  , tubule-occluding agents  , tubule sealants  , and, recently, lasers. , Various studies describe a synergistic action of lasers in association with desensitizing agents. , It has been noted that the laser system can favor the permanence of the desensitizer for longer time than when used alone. Matsumoto et al. and Yamaguchi et al. have reported decrease in hypersensitivity by 85% and 60% respectively in teeth treated with laser. In a double-blind clinical study Gerschman et al. have found significant reduction in treated group in comparison to the placebo group: Ssensitivity to thermal stimuli was reduced by 67%, whereas the placebo group had a reduction of 17%, sensitivity to tactile stimuli was reduced by 65%, whereas the placebo group showed a reduction of 21%. In a systematic review by Kimaru et al. on management of DH by laser has concluded GaAlAs laser of wavelength 800 nm has 30-100% and GaAlAs laser of wavelength 900nm has 73.3-100% effectiveness in management of DH. Better results were obtained by combined intervention of laser and SnF2 gel therapy (G1) in management of DH in the current study. It is possible that the better performance of combined treatment was due to the higher stannous fluoride gel adhesion to the dentinal tubules when combined with laser energy. Even in consideration of the short sample analyzed, it is possible to speculate that the laser-induced superficial melting permits longer tubules occlusion by SnF2 gel emphasizing the reduction of DH-related pain. There was also a significant reduction in sensitivity at 15 minutes followed by further reduction at 2, 7, 14 and 30 days post-treatment. These findings were in accordance with Lin and Lan  who reported that the combined use of the GaAlAs laser (830 nm wavelength) with fluoridation enhances treatment effectiveness by more than 20% over that of laser treatment only. The added advantages of combination of dental laser with stannous fluoride has been reported in another in vivo study by Moritz et al. and suggested that the combined laser treatment and fluoridation result in permanent integration of fluoride on the dentinal tubules. The present clinical study has shown that, addition of fluoride with laser had more reduction which was significant and the reduction was seen immediately after 15 min. Inter visit comparison shows greater change on day 30 with mean value 0.63 in G1 and 1.29 in G2. This result might be due to the synergistic effect of fluoride when used along with the diode laser. Addition of fluoride has synergistic effect on laser desensitization. 1. Collins JF, Gingold J, Stanley H, Simring M. Reducing dentinal hypersensitivity with strontium chloride and potassium nitrate. Gen Dent 1984;32:40-43. 2. Grossman LI. A systematic method for the treatment of hypersensitive dentin. J Am Dent Asso 1934;22:592-602. 3. Rees J.S, Addy M. A cross-sectional study of dentine hypersensitivity. J Clin Periodontol 2002;29:997-1003. 4. Chabanski MB, Gillam DG, Bulman JS, Newman HN. The prevalence, distribution and severity of cervical dentine sensitivity in a population of patients referred to a specialist periodontology department. J Clin Periodontol 1996;23:989-92. 5. Renton-Harper P, Midda M. Nd:YAG laser treatment of dentinal hypersensitivity. Br Dent J 1992;172:13-16. 6. Zhang C, Matsumoto K, Kimura Y, Harashima T, Takeda FH, Zhou H. Effects of CO2 laser in treatment of cervical dentinal hypersensitivity. J Endo 1998;24:595-97. 7. Kimura Y, Wilder-Smith P, Yonaga K, Matsumoto K. Treatment of dentine hypersensitivity by lasers: A review. J Clinical Periodontol 2000;27:715-21. 8. Zanirato R, Curti F, Prezzotto G, De Carvalho E, Pelizon J. E, Bagnato vs. Clinical effects of low-intensity laser vs. light-emitting diode therapy on dentin hypersensitivity. J Oral Laser Appl 2007;7:129-136. 9. Launay Y, Mordon S, Cornil A, Brunetaud JM, Moschetto Y. Thermal effects of lasers on dental tissues. Lasers Surg and Med 1987;7:473-77. 10. Matsumoto K, Tomonari H, Wakabayashi H. Study on the treatment of hypersensitive dentine by laser. J Conservat Dent 1985;28:1366-71. 11. Yamaguchi M, Ito M, Miwata T, Horiba N, Matsumoto T, Nakamura H, et al. 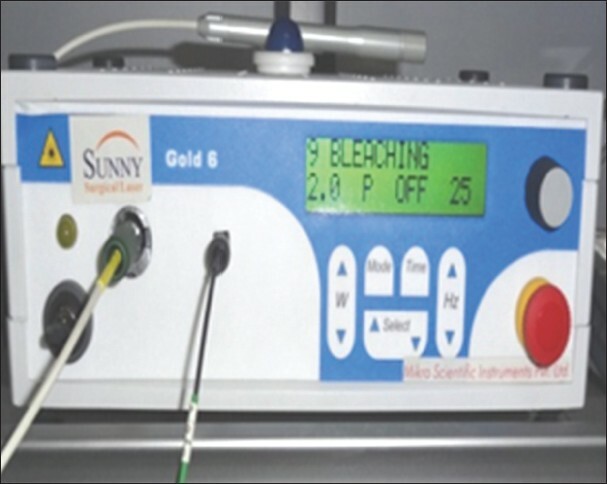 Clinical study on the treatment of hypersensitive dentin by GaAlAs laser diode using the double blind test. Aichi Gakuin Daigaku Shigakkai Shi 1990;28:703-7. 12. Gerschman JA, Ruben J, Gebart-Eaglemont J. Low level laser therapy for dentinal tooth hypersensitivity. Aust Dent J 1994;39:353-7. 13. Kumar NG, Mehta DS. Short-term assessment of the Nd:YAG laser with and without sodium fluoride varnish in the treatment of dentin hypersensitivity: A clinical and scanning electron microscopy study. J Periodontol 2005;76:1140-47. 14. Goharkhay K., Wernisch J., Schoop U., Moritz A. Laser treatment of hypersensitive dentin: Comparative ESEM investigations. J Oral Laser Appl 2007;7:211-23. 15. Tarbet W. J., Silverman, G., Stolman J. M., Fratarcangelo P. A. 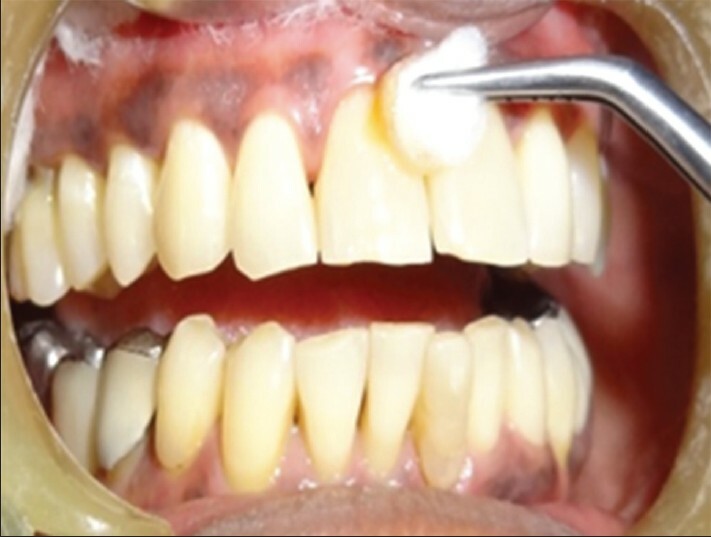 Clinical evaluation of a new treatment for dentinal hypersensitivity. Journal of Periodontology 1980;51:535-540. 17. Kerns DG, Scheidt MJ, Pashley DH, Horner JA, Strong SL, Van Dyke TE. Dentinal tubule occlusion and root hypersensitivity. J Periodontol 1991;62:421-28. 18. Flynn J, Galloway R, Orchardson R. The incidence of hypersensitive teeth in the west of Scotland. J Dent 1985;13:230-6. 19. Wichgers T.G, Emert R.L. Dentin hypersensitivity. General Dentistry 1996;44:225-32. 20. Lan W.H, Liu H.C, Lin C.P. The combined occluding effect of sodium fluoride varnish and Nd:YAG laser irradiation on human dentinal tubules. J Endo1999;25:424-26. 21. Moritz A, Gutknecht N, Schoop U, Goharkhay K, Ebrahim D, Wernisch J et al. The advantage of CO2-treated dental necks, in comparison with a standard method: Results of an in vivo study. J Clin Laser Med Surg. 1996; 14:27-32.